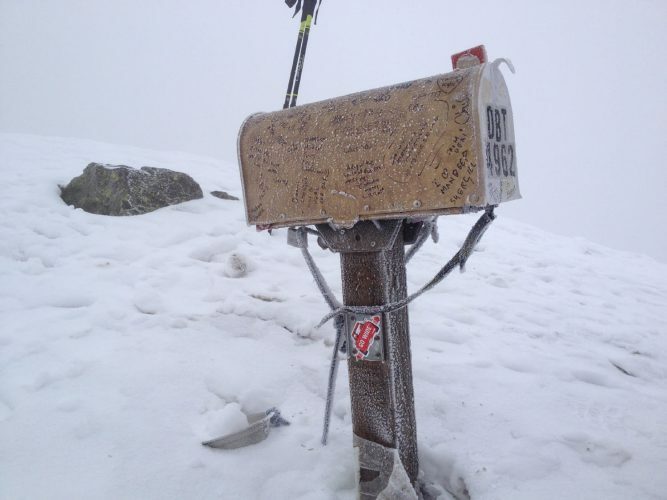 Let’s get this out of the way right away: Mailbox Peak is steep! 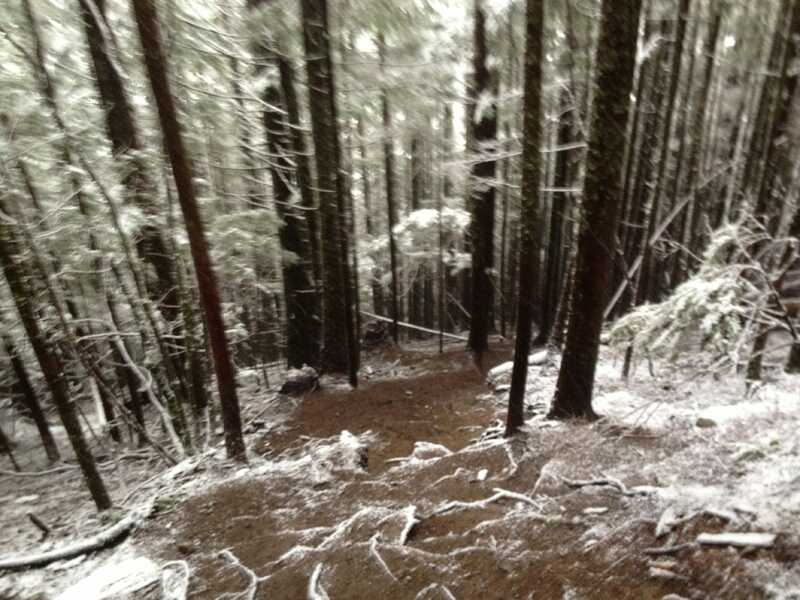 Yeah, yeah, yeah 4,000 feet of elevation gain in less than 6 miles – you’ve heard it all before. Wait, 4,000 feet of elevation gain in less than 6 miles round trip?! OK, now we’re talking steep, for real. More specifically, this trail gains about 3,800 of its 4,000 feet in about 2.5 miles, so the tally for the main portion of the climb is more like 3,800 feet of gain in a 5 mile round trip. The very beginning of the trail consists of walking up a blocked gently-sloped road and ascending only about 200 feet, so you can raise the overall totals to about 4,000 ft. of gain in a 6-mile loop. 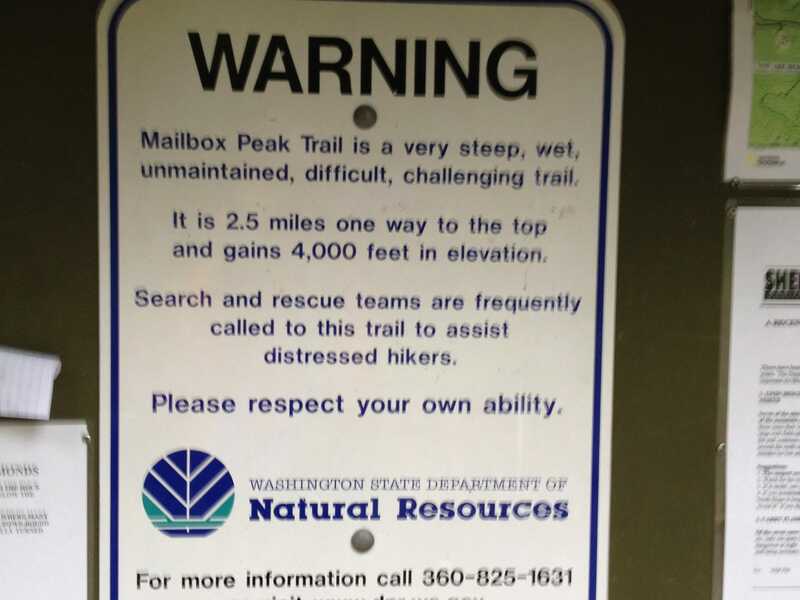 Starting at the gravel parking lot at the end of SE Middle Fork Road, head up the gated road on foot until you reach the official start of the Mailbox Peak Trail on your left. 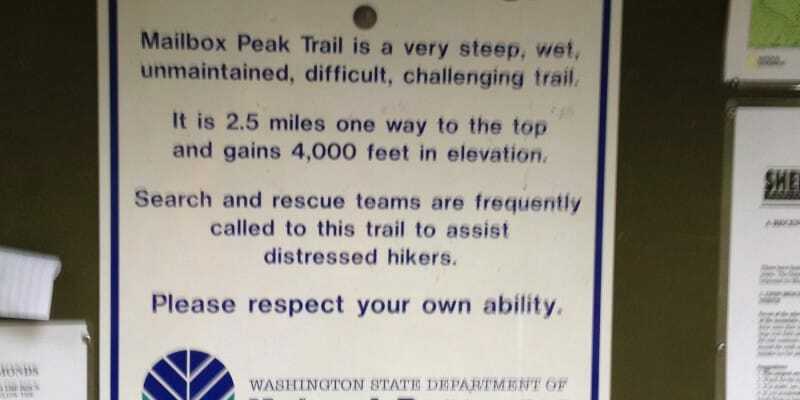 Snap a few pictures of the signs warning of the steepness and seriousness of the trail and start heading uphill. Not surprisingly, the trail starts gaining elevation almost immediately, offering up a few switchbacks in the early going. As you gain elevation, the switchbacks become fewer and farther between and the exposed root systems try to trip you up as the trail takes a more vertical, direct approach to rocky summit above. Despite the vertical nature of the route, the abundance of reflective markers – many of which are filled with encouraging messages for those in need of an anonymous pep talk – make the trail relatively easy to follow. 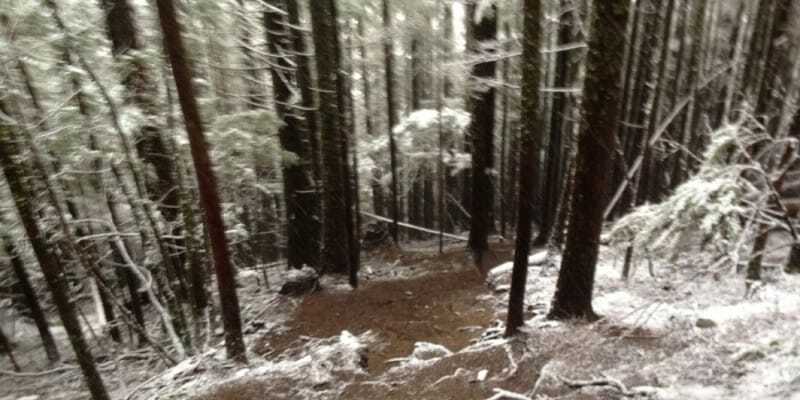 Continue up the forested section of the trail, keeping an eye out for the reflective markers, until emerging from the trees. 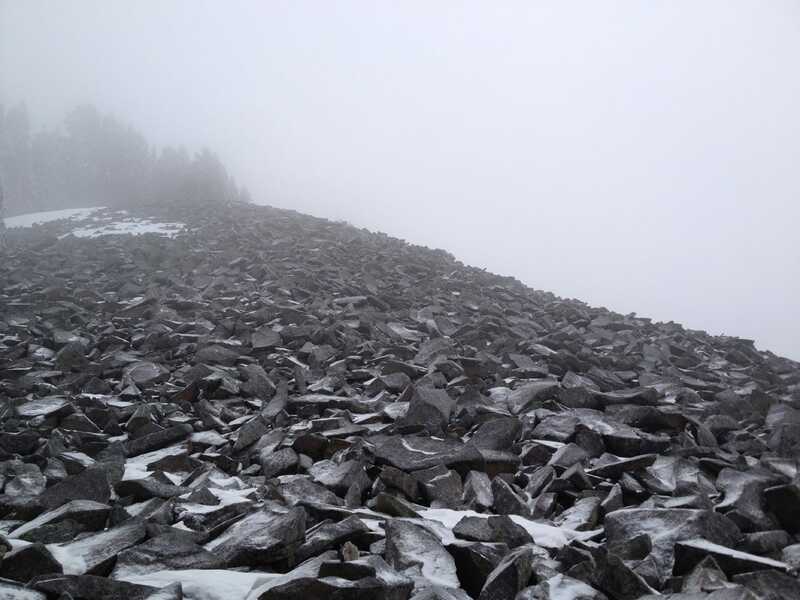 Once hitting about the 4,000-foot mark in overall elevation, the trail emerges from the trees and a large talus slope emerges. Head to the left and begin the final push to the summit. Fear not, the best is yet to come. 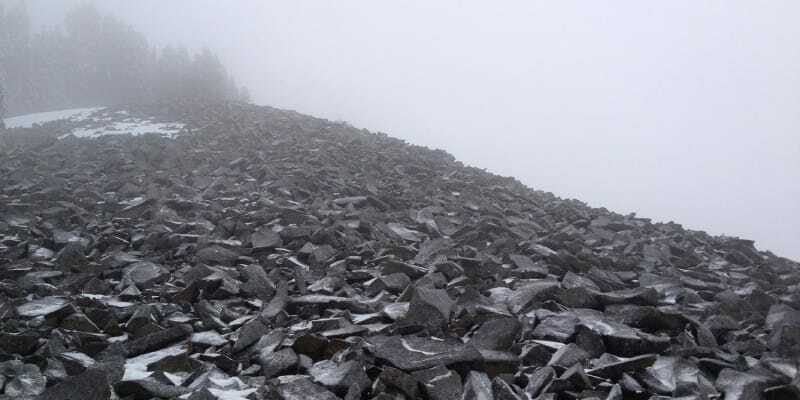 Scramble up the last half mile – and about 800 feet of elevation – on exposed rock to tremendous views of Mount Rainier and other surrounding peaks. Don’t forget to check the mail.